The Office of Technology Research and Investigation (OTech) is located at the intersection of consumer protection and new technologies. As a trusted source for research and information on technology’s impact on consumers, the Office conducts independent studies, evaluates new marketing practices, and provides guidance to consumers, businesses and policy makers. It also assists the FTC’s consumer protection investigators and attorneys by providing technical expertise, investigative assistance, and training. The Office is housed in the Bureau of Consumer Protection and its work supports all facets of the FTC’s consumer protection mission, including issues related to privacy, data security, connected cars, smart homes, algorithmic transparency, emerging payment methods, fraud, big data, and the Internet of Things. For additional technology-related content, please visit the Tech@FTC blog. Help protect consumers through research. The FTC welcomes researchers to inform us of their latest findings by emailing papers to research@ftc.gov. Please note that the FTC does not offer compensation of any kind to research submitters and that submitted research may be made public by the FTC. If your research reveals a security vulnerability or otherwise contains information that could pose a risk of harm to the public, before submitting the research to the FTC, please contact Dan Salsburg, Chief Counsel and Acting Chief of OTech, at dsalsburg@ftc.gov or 202-326-3402. What do glue, non-standard machine screws, and proprietary diagnostic software have in common? They make it harder for consumers and independent repair shops to fix electronic devices and other consumer goods. On July 16, 2019, OTech and the FTC’s Division of Marketing Practices will be holding a workshop on repair restrictions. 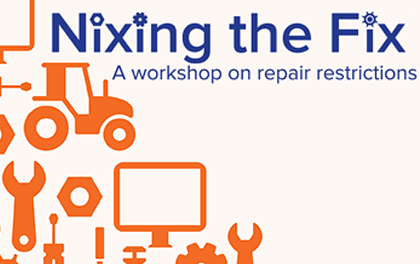 In advance of the workshop, we’re calling on researchers to send us data and empirical research examining the prevalence and impact of repair restrictions. Research and data should be submitted by April 30, 2019, for it to be considered in the planning of the workshop.